This is a project of the Terrestrial ecology, carbon, and climate research theme, part of the Climate and Environmental Dynamics thematic research group, and the Ecosystem processes research theme, part of the Biogeography and Biogeomorphology thematic research group. Fossil fuel burning is causing atmospheric concentrations of the greenhouse gas CO2 to rise, the main driver of man-made climate change. However, the rate of CO2 rise is much slower than emissions suggest it should be. It appears that the land surface and oceans are together absorbing about 50% of annual CO2 emissions. Some field studies indicate that a large portion of the land surface uptake is due to increasing tree growth. However, the causes, locations, and future behaviour of this CO2 uptake remain highly uncertain. A plausible hypothesis is that this land uptake is occurring because higher levels of CO2 increase plant photosynthesis, meaning more carbon in plants. However, a number of scientists believe that tree growth is not commonly limited by the rate of photosynthesis itself, but is instead controlled by other factors such as rates of cell division, nutrients, or water supply. If this is true, it implies lower future uptake of CO2 on land than is currently assumed, and so greater rates of climate change. Improving our knowledge of plant responses to CO2 is clearly essential for policy makers to be able to forecast with confidence the impacts of any controls on CO2 emissions on future climate. When tree growth is limited by photosynthesis, we talk about 'carbon-limited' growth, whereas when it is limited by nonphotosynthetic factors, it is 'sink-limited'. So, the extent to which trees are carbon-limited, and under which circumstances, is fundamental to understanding how they will respond to rising levels of CO2. Advocates of the importance of sink-limited growth point to findings of high concentrations of non-structural (storage) carbon observed in wood as evidence that carbon is abundant and not limiting, and thus growth is dominated by sinks, rather than by photosynthesis. In this project, we propose to significantly improve our understanding of this fundamental issue using a unique combination of observations, experiments, and modelling. 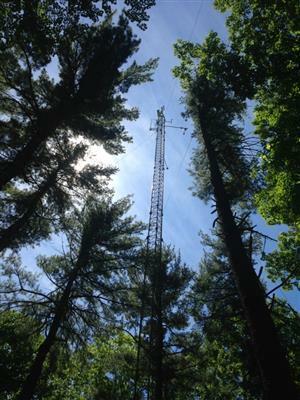 We will focus on mature individuals of white pine, red maple, and red oak growing in Harvard Forest, Massachusetts. This is an international collaborative project, with the modelling and detailed wood development work led by the University of Cambridge and the field and laboratory carbon measurement work led by Harvard University.